Ok, long story short, I’ve been in the mood for a little accent nail lately, with a little nail art. I love anchors, so much so I have a tattoo of one. Actually, so does my husband, we got matching tattoos on our honeymoon. 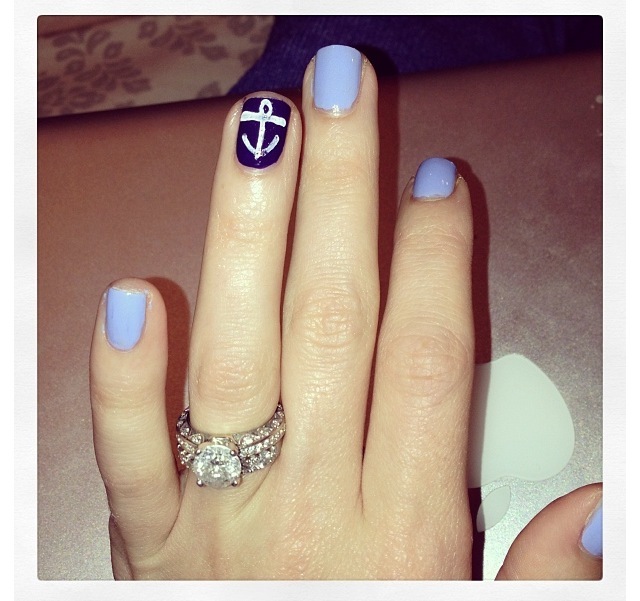 I chose the anchor because I felt it was very, very symbolic. I have an anchor on my wrist with the coordinates of where we got married underneath, I felt it symbolized ‘where I dropped my anchor.’ cheesy right? 😉 anyway! Who doesn’t love an anchor? If you do, here are some step by step tips to create one in your mani! Step one: When whichever nail you’re using as the accent nail is completely dry, start by drawing a straight line across your nail horizontally, towards the top. Step two: Draw a straight line from the center of the first line all the way down. It will basically look like a T.
Step three: Close to the bottom of the T but not completely, make two rounded lines, one off of each side. They’re kind of like half parenthesis. Step four: At the top & center of the T, make a small circle. Step five: Wait for the art to dry and slap a top coat on there. There you have it! The anchor is that easy! Test it our yourself and send me pics! Until next time, kisses! Previous PostPrevious A Little Shameless Self Promotion. Next PostNext Que pasa, ombre?